_Quarterly is moving onto their fourth issue, “Sea”. And while that itself is exciting, the announcement of the release party at Silent Barn, with performances by poet Chelsea Hodson, Robert Lowe’s always pleasing solo project, Lichens, and Soft Circle, makes the entire _Quarterly #4 package too good to pass up. All the info is below the flyer. 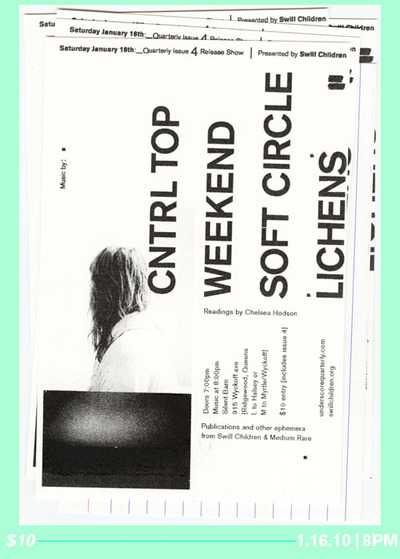 There will be music by Soft Circle, Lichens, CNTRL Top, and Weekend, with readings by Chelsea Hodson. Publications and other ephemera from Swill Children & Medium Rare will also be available. $10 at the door, includes Issue 4.